Member of the Grocery Manufacturers Association (GMA). E & J Gallo Winery, Inc. Member of Grocery Manufacturers Association (GMA). National Fruit Product Co. Inc.
William B. Reily & Co., Inc. Donated $23,500 to support GMO labeling campaigns. Donated $172,500 to support GMO labeling campaigns. Donated $5,000 to support GMO labeling campaigns. Donated $11,000 to support GMO labeling campaigns. Donated $50,000 to support GMO labeling campaigns. Donated $14,104 to support GMO labeling campaigns. Donated $10,000 to support GMO labeling campaigns. Donated $1,000 to support GMO labeling campaigns. Donated $195,000 to support GMO labeling campaigns. Donated $2,500 to support GMO labeling campaigns. Donated $25,383,677 to support GMO labeling campaigns. Donated $1,022 to support GMO labeling campaigns. Donated $25,000 to support GMO labeling campaigns. Donated $1,250 to support GMO labeling campaigns. Donated $57,500 to support GMO labeling campaigns. Donated $135,000 to support GMO labeling campaigns. Donated $22,500 to support GMO labeling campaigns. Donated $125,000 to support GMO labeling campaigns. Donated $451,000 to support GMO labeling campaigns. Donated $1,500 to support GMO labeling campaigns. Donated $974,825 to support GMO labeling campaigns. Donated $20,000 to support GMO labeling campaigns. Donated $301,000 to support GMO labeling campaigns. Donated $15,000 to support GMO labeling campaigns. Donated $21,000 to support GMO labeling campaigns. Donated $3,000 to support GMO labeling campaigns. Donated $4,500 to support GMO labeling campaigns. Donated $12,500 to support GMO labeling campaigns. Donated $7,500 to support GMO labeling campaigns. Donated $4,000 to support GMO labeling campaigns. Donated $15,100 to support GMO labeling campaigns. Donated $65,000 to support GMO labeling campaigns. Donated $2,490,000 to support GMO labeling campaigns. Donated $26,000 to support GMO labeling campaigns. Donated $208,000 to support GMO labeling campaigns. Donated $1000 to support GMO labeling campaigns. Donated $$$$ to support GMO labeling campaigns. Donated $Late July Snacks to support GMO labeling campaigns. Donated $35,000 to support GMO labeling campaigns. Donated $20,250 to support GMO labeling campaigns. 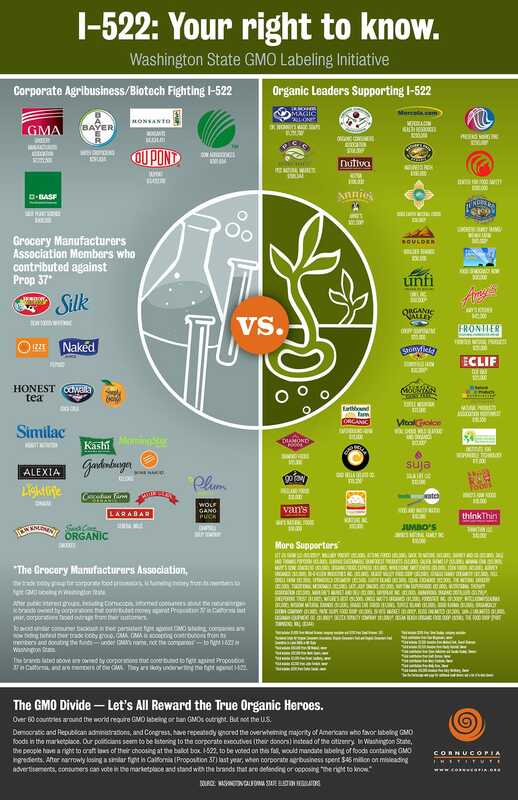 Owned by Campbell's, which has chosen to label all of its products that contain GMOs, and they have also decided to support mandatory national GMO labeling. Campbell's has chosen to label all of its products that contain GMOs, and they have also decided to support mandatory national GMO labeling. Bobs Red Mill Natural Foods Inc. Donated $45,000 to support GMO labeling campaigns. Donated $11,200 to support GMO labeling campaigns.